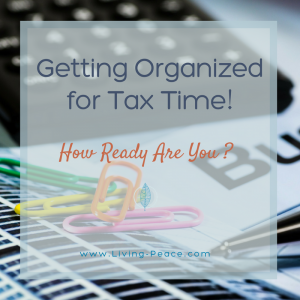 Organized for Tax Time! How Ready Are You? It’s that time of year again! Time to pull together our financial information so we can file our taxes. With a little preparation and organization, the process can go smoothly although it probably won’t change the outcome if you end up owing! Whether you do your taxes yourself or as in my case, give to an accountant, I’ve found a few things that help get me ready to round up what I need each year. Being both self-employed and working as an employee in two different careers, I need to track information differently. It’s certainly easier for the employee-side of my life since my employer takes out the proper taxes before paying me, and everything is captured electronically in my paystubs, which I can access online. Review every two weeks or as you get them. If you get paid hourly, make sure that the hours submitted are captured correctly. It’s a good idea to check your bank statement to verify any direct deposits as well. Since my work involves driving to various clients, some who are located 40+ miles away, I track my mileage for both my organizing and massage related travel. I personally use an excel spreadsheet for tracking mileage and also track any expenses such as tolls or paid parking on a separate sheet in the same excel document. Prefer to track mileage on your phone? There an app for that! Here’s two lists that highlight many of the app’s available – Mileage Tracking App’s and another resource for 3 more app’s that may be useful. 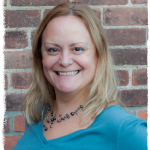 I am a massage therapist in addition to my work as a professional organizer. For the self-employed side, I have a lot to keep track of. I track clients, how many hours of massage I do each year, what each client paid and how they paid me (credit card, check, cash) including tips and credit card fees, gift certificates paid to me by the studio owners. In addition to the rent and fees I pay to the massage studio where I do my massage work, and any private clients, I also track expenses such as mileage, oils and lotion, candles, massage tools, massage training’s, and any other associated costs. Each month I sync up my banking statements and the credit card fees, as well as deposits from paid massages. Make it a habit to sit down every week to track and record information so that it doesn’t build up, become overwhelming, or possibly get lost in the shuffle. Since I track it in excel, it is easy at the end of each tax year to compile the overall data and discuss with my accountant. Besides excel, I keep a couple of file folders to store paper receipts like candle purchases, parking receipts, etc. along with my accordion file for paper backup for healthcare expenses, donation receipts, and any other items I may need to submit to my accountant. Overall, I use a combination of electronic and paper filing. Storing bank statements and paystubs electronically (plus mortgage and escrow statements when I had a mortgage), and also client payments that I have deposited using my bank’s mobile deposit app (love this feature!) The mobile deposit app saves me from having to go by the bank every time someone pays by check. I will usually take a picture of the check and then a phone screen capture of the deposit confirmation until I can reconcile to my banking. I do the same for gift certificates so I can ensure that I get paid for them by the studio owners. Having a system in place, keeping my information updated and maintained monthly (mostly), makes this time of the year so much easier. I usually cull through the accordion file in late January, once I’ve received my W-2 and 1099 forms. Calculate final numbers and make sure I have everything recorded on the excel sheet for the self-employment aspect. Then I book my appointment with my accountant so I am not scrambling on April 14th to get my taxes filed on time!